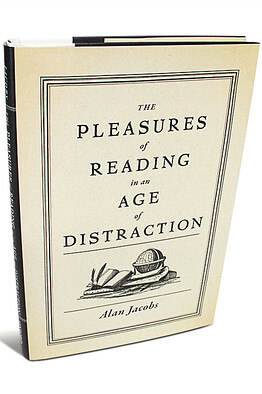 Added recently to our English teachers' reading list is The Pleasures of Reading in an Age of Distraction by Alan Jacobs. The distractions are all the obvious ones in our electronic age - the web, social networking, texting and so on. Jacobs, an avid and fluent reader, found himself increasingly stymied when attempting to read the long texts which he once devoured, and this book is his response to this dilemma. It is also a passionate defence of the importance of pleasure in reading, and casts a sceptical eye on worthiness. It's a greatly pleasurable read itself, and Jacobs is an affable and intelligent companion. It should prompt plenty of thought on what is one of the central issues of our vocations. A key word for Jacobs is 'Whim'. Reading should not be programmatic, and we should take ourselves where we fancy. As he writes, "the child who reads with a pure enthusiasm, signaling nothing to anyone, is beautiful": it is this kind of enthusiasm that is easiest in childhood, and which is very hard to recapture. He also discusses the way the Kindle rescued his 'pure enthusiasm', the importance of marking certain kinds of books ("Reading with a writing instrument in hand is an unnatural act for many readers, yet I think in most cases it is necessary to attentive response"), the pleasure of 'upstream' books (those which have come before, influenced and shaped our current reads) and much more. The“pedagogical challenge” for teachers, in the foreseeable future, will be to combine hyper attention with deep attention and to cultivate both. What reading teaches, first and foremost, is how to sit still for long periods and confront time head-on. Below, Jacobs discussses the book and answers questions on his ideas. Alan Jacobs discusses 'The Pleasures of Reading in an Age of Distraction' from The New Atlantis on Vimeo.